It is distressing and potentially expensive when your favorite pair of sandals breaks. However, you may be able to do some minor repairs and get some more wear out of them. This is a guide about repairing sandals. 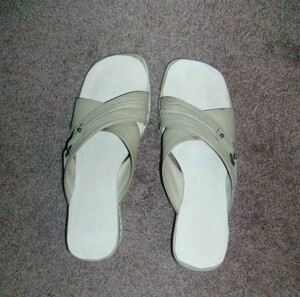 I purchased a pair of sports sandals for $.50 at the thrift store. I hadn't noticed a plastic clasp was broken on one side of a sandal. Since there was no way to wear the sandal and the plastic piece couldn't be fixed, I decided to get pliers and completely break the piece off the sandal and do the same to the other side. I knew I didn't have anything to use for replacement pieces for the sandals and didn't want to throw them away. I didn't have money to pay for their repair either. I realized whatever I needed had to be something flat, to slip the strap through, and that I needed two of them; one for each sandal. I ended up using a plain key ring, which works nicely. It was tricky to attach at first, but does serve the purpose. I'm glad I can use the sandals for a long time to come and the repair was free, using what I had on hand! I have a pair of sandals that I got about 2 years ago at the thrift store. I wore them so much, they got pretty ratty on the part where you put your foot in and the foam part of the padding started coming up. They were just not a pretty sight while off, but they are still OK on. Believe it or not, I've gotten many compliments on these $5 sandals! I wanted to fix them up, so I started thinking about what I could do. I figured that since they now sell shoes that have suede/sueded lining, I could check out the craft store and see what I could use to cover the lining. I ended up buying a piece of suede and cutting it to fit, and then super gluing it in. They look so much better now, and although it's not perfect, I get to keep wearing the shoes I love. I have been shopping for replacements for a low price for a while, but I really wanted to keep these shoes. I'm sure this will prolong their life! I have some rubber after sport sandals that I find to be very comfortable. 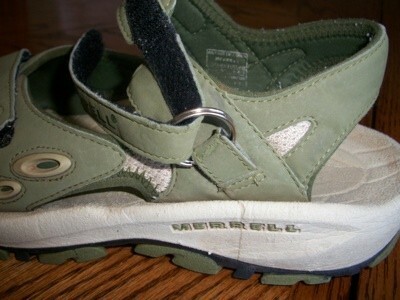 Unfortunately, the straps disengage long before the sole wears out, rendering them useless. I have used them a lot, and am not complaining about how long they've lasted, only about how I wish they'd last even longer! As I have a very difficult time finding shoes that fit, I need to keep these few pairs going as long as possible. I actually solved the problem and will be able to use the sandals a bit more. I don't know how long the glue will hold, but it's been a few days with a lot of use, and so far, holding tightly. The glue was purchased from HSN and is called "Insta Fix". It binds many different surfaces together within seconds, so there's no time to fiddle with the fit - you must know what to do in advance. I also glued the knob back on a cabinet door after the screw broke in half - certainly much less expensive than replacing all the matching knobs. The wonderful discontinued sandals are called R Max 2 and at http://www.ridersandals.com I have posted this address so that you can be aware of the material used in their construction. Does anyone have a simple, fast way to repair flip flops? My DD's are slightly torn where the strap goes into sole. The strap will not stay in so she can wear them, and not sure what kind of glue would work on foam rubber flip flops. They are cheap ones from the Dollar Store. Hi Jmz, I have been wearing flip-flops for years some can be fixed others ya just have to say goodbye. Here's one way to fix them. If the only problem is the hole on the bottom has gotten loose, get a empty two liter Coke bottle cut a circle about one or two in. cut circle half way- to the middle, then cut small circle from there just big enough for the part that goes between the toe, now turn shoe over slip plastic around toe part. I hope I'm explaning this correctly, I'm still working on my first cup of coffee. My mom would use a large safety pin to fix them. Feed the piece through the hole. Push the pin through the tip horizontally. It should lie flat on the sole. I'm not sure how long this lasts. I just know if we were out and our flip flop broke, she always did this. She would also cut the canvas toes out of our tennis shoes when they got too short! Boy, that was a long time ago. Talk about frugal. This gives me a good laugh! I just bought a pair of Bass sandals. They're comfortable suede, but with each step I take, the air is compressed out of the footbed, making a squishy sound. Anyone know how to stop the sound? I had the same problem. I know this sounds crazy but I started wearing real thin socks. No more squishy. Socks seem to absorb the moisture. I have a couple of really comfy pairs of sandals, but have scratched the tops of them where I have accidentally dragged my toes along the ground whilst walking! They still have a lot of wear left, but the only part of the sole you can actually see is now all scratched. Any tips on how to cover this up? If shoe polish doesn't cover, you can cover the scuffs with a matching sharpie. The other day I got caught out in a heavy downpour while wearing a pair of suede sandals - Birkenstock style. Now they are all stretched out! Is there any way to shrink them back to their original shape? If you have a blown out flip flop, you may be able to temporarily thong to stay in place with a plastic bread clip. 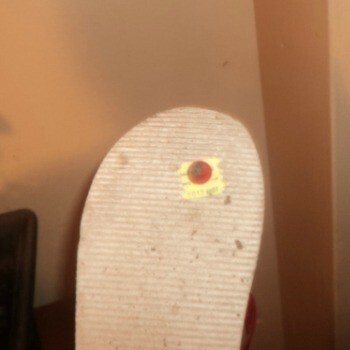 Use a bread tag for a broken flip flop for a quick and easy fix for your footwear. This is a guide to fixing squeaky sandals. Squeaky sandals can be truly annoying to listen to and sometimes difficult to fix.